You are here: Home » Halakha & Modernity » Is a Father Obligated to Perform His Son’s Brit Milah? Is a Father Obligated to Perform His Son’s Brit Milah? In discussing the nature of the father’s obligation to give his son a bris, we encounter a question: is the father obligated to perform the bris himself (if possible), or only to take the responsibility to make sure that the bris is performed? The practical relevance of this question is twofold: (a) Is there a preference for him to do it himself if he is able and competent and (b) is it meaningful for him to appoint the mohel his shaliach (agent) if he does not do it himself? The Rishonim are divided on this point. Ramban, Tosafot, Tosafot Rid, and Maharch Or Zarua (son of the Or Zarua) all state that it is only the father’s responsibility to see that his son get a bris, not to do it himself. They infer this from the discussion in the gemara about the mother’s obligation, which is ruled out because of the verse “as God had commanded him (Avraham)” – “him” not “her”. Why, these Rishonim ask, did we need such a verse? Isn’t the woman exempt because it is a time-bound mitzvah? Tosafot go further – according to the opinion that a woman cannot be a mohel (an issue debated in the gemara), how could the Gemara have thought that the mother was obligated? The answer, according to these Rishonim, is that the discussion is not about her personal obligation, about an obligation to do the milah herself, but only about an obligation to see that it gets done. Thus, it does not follow the normal rules of time-bounded exemption (Tosafot Rid elaborates on this by stating that the handling of the arrangements is not limited to any time of the day!). In this way it also parallels the obligation of Beit Din if the father is not present. Theirs is an obligation to make sure the child has a bris, not to do it personally. This is also the obligation of the father. As such, Maharach Or Zarua states that even if the father is a mohel, there is no need or value in his doing the bris himself. On the other side of the debate is a statement quoted by the Rema in the Darkhei Moshe (YD 264:1) in the name of the Or Zarua (the Maharach Or Zarua’s father) that if the father can do it himself it is forbidden for him to have someone else do the milah. Clearly, he understands it to be the father’s personal mitzvah. This position also seems to be supported by the Rosh in a discussion regarding stealing a mitzvah from someone else. He states that if the father was planning to do the milah and someone else did it, it is considered that he stole the father’s mitzvah and must pay the father a fine. The Rema in Choshen Mishpat (382) rules like the Rosh, and the Shakh agrees and states that the conclusion from this is that if the father is a mohel, it is forbidden for him to give the mitzvah to someone else. 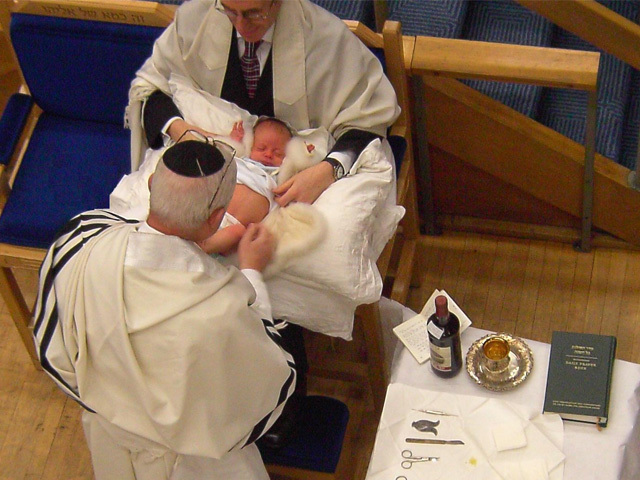 Thus, we find nowadays some fathers who follow this opinion and choose to do the bris for their own son (with the mohel setting it up beforehand and being present at the moment). However, it should be noted that even according to this opinion, it was only stated that the father should do it if he is a mohel, and did not say this for an amateur. Moreover, the poskim say explicitly that if there is someone better available, then the father should have the more competent person do it. There is an infant and his well-being at stake here, and, in my opinion, being “machmir” for this approach is a classic example of a chumrah at the expense of others and should not be done. Now, if the father is not doing it himself, should he appoint the mohel as his shaliach? This is what the Darkhei Moshe (YD 264:1) says. However, his ruling in Choshen Mishpat (382) in the name of the Rosh contradicts this. There he rules that once the father has given the mitzvah to a mohel, it is not the personal mitzvah of the mohel (and one would not be fined for “stealing the mitzvah” from the mohel). It seems according to this that, even if it starts as the father’s personal obligation, when he chooses not to do it himself, it stops being a personal obligation and becomes an obligation to see that it gets done. Now, why is this the case? Why not consider it as his obligation that is done through a shaliach? The Ketzot explains that if it is a personal mitzvah, the idea of shaliach is not relevant. I cannot make a shaliach to take lulav for me, or eat matzah for me. Personal mitzvot must be done personally. Thus, if someone else is doing it, it must be (at least at this stage) a mitzvah to get it done, not to do it oneself. The Rema in Darkhei Moshe understands that for some reason the idea of shaliach is relevant here, perhaps because the Torah had to allow for it given that fathers are mostly not able to do it personally. Thus, the practice to appoint the mohel as his shaliach assumes: (1) that it is the father’s personal mitzvah and (2) that the concept of shaliach is relevant here. I think that both these assumptions are questionable, and thus while no harm is done in appointing the mohel a shaliach, I do not believe that there is much of a point in the practice. The two brakhot we make at the bris – ‘al hamila and li’hakniso b’vrito shel Avraham Aveinu – actually reflect these two components. The mohel’s brakha, ‘al hamila, is over the act of the bris itself, as distinct from the responsibility to have it done. The use of “‘al hamila” as opposed to “la’mol” is because it is not his personal obligation. When the father does the milah, there is a debate if he says “al hamila” or “la’mol et haben” (see YD 265:2), and this may reflect the above debate about whether the father has a personal obligation to perform the act, although it is possible that other issues are at play. The second brakha is made by the father, and is done partly to express the larger significance of the act – it is not just a simple mitzvah, but it brings the child into the covenant. [It is interesting to think about other brakhot over mitzvot that express the larger significance of the act. Some are particularly tied to lifecycle events – birkhat kiddushin in particular. Others to very central faith issues – birkhat kriat shema is a prime example of such.] Beyond this, however, it reflects the father’s obligation to see that the bris be performed, as distinct from doing it himself. The congregations response is significant here. The congregation then responds -“ ki’shem she’nikhnas labrit...” Now this response was originally subtly but significantly different. It was – “ki’shem she’hikhnasto la’brit, ken takhni’seihu l’Torah li’chuppah u’li’ma’asim tovim.” “Just as you have brought him into the bris, so should you bring him into Torah, chuppah, and good deeds.” There response was a blessing to the father to fulfill his other obligations to his son – to teach him Torah, to see that he gets married, and to teach him a trade and make him a responsible member of society. Thus, the father’s brakha of “li’hakniso” is a statement that he has discharged this obligation towards his son. In this context, it is clear that the obligation is to see that the bris be performed, and not that he do it himself, just as it is not his obligation to personally teach him Torah and a trade and to find him a wife, but just to ensure that all of these are done. Whether the mother has an obligation to take care of the bris if the father is not available is debated in the poskim. On the basis of the gemara in Yevamot (71b), the Maharach Or Zarua concludes that the mother does have such an obligation before the obligation reverts to beit din. Others disagree. An important ramification of this debate is whether, in such a case, the mother could make the brakha “li’hakniso”. The current practice in such a case is to have a male relative make the brakha as a representative of the beit din. As a final note, it should be mentioned that the reason that the brakha was changed to the passive tense (“just as he has entered into, so he shall enter into..”) was because of cases of babies who fathers had died, and thus there was no father to give this blessing to. Thus, the text was changed to refer to the baby and not the father. So as not to make such families feel different and possibly embarrassed, this revised text was then used in all cases. This is a very important lesson for all of us regarding the sensitivity that we must have in general, and in particular around lifecycle events.